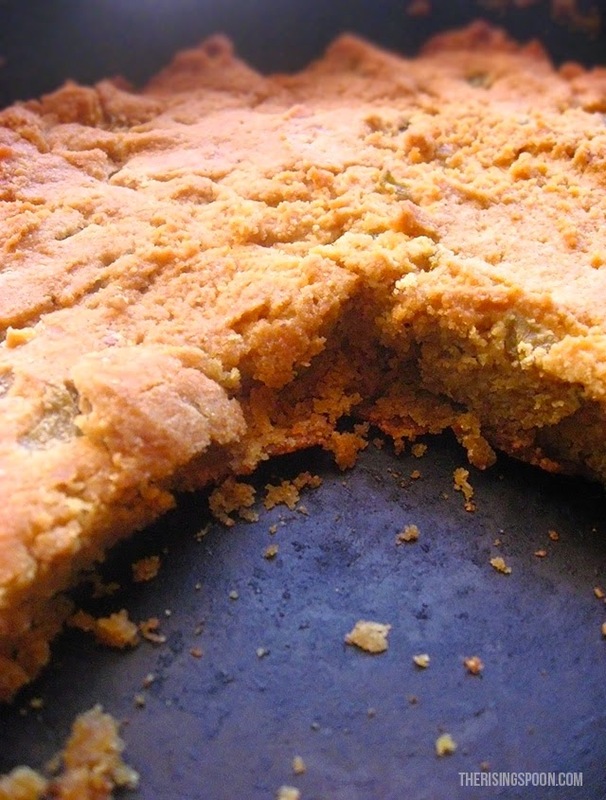 I grew up eating what I'd consider Southern style cornbread with a touch of sweetness. My aunt always served it with specific meals like beef chili, white chicken chili, and sometimes soup. Back then she just used that iconic blue Jiffy box, which probably had the biggest influence on why it was the sweet variety. These days I use far less sugar in my foods, have a penchant for savory things, and rely less on pre-packaged foods. Even still, up until about a year and a half ago I kept a box of Jiffy cornbread mix in my pantry. I only make cornbread 4-5 times a year (my boyfriend doesn't particularly like it) and seeing that box makes me nostalgic. But one day while I was sorting through my pantry checking expiration dates, I decided to flip the cornbread box over and peek at the ingredients list. Lo and behold, two of the main ingredients were hydrogenated lard and partially hydrogenated lard. Now, I have no issue with lard by itself. I love bacon grease and pig fat! Lard is a traditional fat that folks have been cooking with for hundreds of years, if not more. Hydrogenated and partially hydrogenated oils, on the other hand, are a modern invention. They're created by heating natural oils to extremely high temperatures (500+ degrees) and inserting hydrogen by using a catalyst. This helps to solidify the oil at room temperature and increase its shelf life. That's why if you check the back label of many packaged foods like crackers, cookies, doughnuts, etc. you'll see these two oils listed. It's a way for food companies to extend the shelf life of their products, while also making them taste good. Remember, fat = flavor. But in this case we want natural fat, not highly processed "food product" fats with chemical properties (like trans fats) that we have yet to fully understand. The main ingredient in cornbread is cornmeal (or masa harina, which is what I used), so as long as you have that the only other things you need are milk (regular, buttermilk, coconut milk, etc. ), an egg, salt, some form of cooking fat (like bacon grease, butter, or coconut oil) and (if you want to) a bit of flour and sugar. The last two are optional. Pretty basic stuff, eh? Well, if there were any cornbread zealots reading this, they probably just left the page. 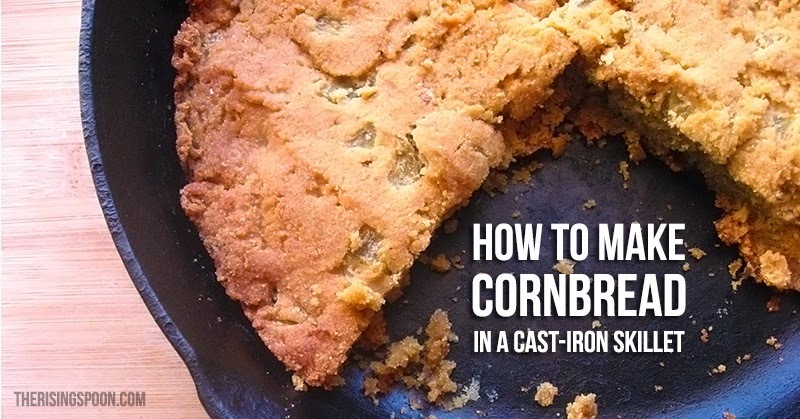 There are SO many different ways to make cornbread. Many of the recipes are regional, others are just passed down within families through the generations. Some folks like their cornbread sweet, others would pitch a fit if you brought sugar anywhere close to their beloved cornbread. Then there are those who add in extras like corn, jalapenos, and chiles. Like I said, lots of recipes...lots of options. This version may not be your mama or grandmama's recipe, but don't let that stop you from trying something new or adapting it to suit your tastes. And if you've never heard of masa harina before, pop over to my post on how to make homemade corn tortillas with masa harina. The recipe definitely has a full-on corn flavor, so get ready! Cast-iron skillets or pans get REALLY hot and retain their heat evenly throughout cooking, so they're excellent for forming a nice bottom crust on the cornbread. I have to admit, I had no idea you could do this. For years I ate cornbread that was uniform throughout and fell apart with the slightest touch. Sure, it tasted good, but I couldn't do much with it other than stick it on top of chili. The trick to forming a nice bottom crust is to heat the skillet up while the oven is pre-heating with some fat like bacon grease or coconut oil so it's sizzling by the time you pull it out. When you pour in the batter and quickly smooth it out in the cast-iron skillet the cornbread will immediately form a crust. Cool, right? However, I can't take credit for the idea. I got it from Elise over at Simply Recipes. This recipe is slightly adapted from hers. She should get all the credit! And, I have to say that this crust makes a HUGE difference. You can cut a slice of cornbread, place a dollop of butter on top, and eat it by hand cause it holds together well. And it tastes fantastic! This is the ONLY way I'm making my cornbread from now on. Learn how to make this savory homemade cornbread recipe in a cast-iron skillet using non-gmo masa harina for extra corn flavor, green chiles for a kick, and bacon grease for a crispy bottom crust. Pair with your favorite comfort foods like chili or soup! 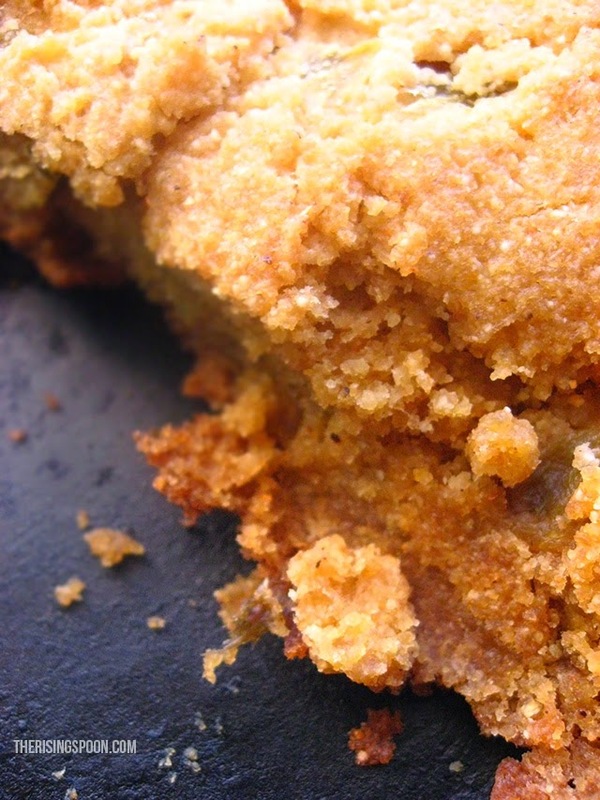 Optional: If you like your cornbread sweet, mix in a few tablespoons of sugar or your favorite sweetener. You can also substitute buttermilk for extra tang. To make a faux buttermilk, stir 1 tablespoon of white vinegar into the milk and let it sit for ten minutes before adding to the recipe. Note: If you use unsalted butter and/or omit the bacon grease, you'll probably need to double the salt to make up for it. Measure a tablespoon or so (you can eyeball it) of bacon grease into a cast-iron skillet or other oven safe dish that retains heat well (like enameled cast iron) and then stick it into the oven in the middle rack. Pre-heat the oven to 400 degrees and start working on the batter. Mix the dry ingredients together (masa harina or corn meal, baking soda, sea salt) in a large bowl. In a separate bowl, whisk the egg and milk together, then open the can of green chiles and dump that in with the liquid ingredients. Gently melt the butter either on the stove-top or in the microwave (don't let it boil) and mix it into the milk and egg. Combine this with the dry ingredients, making sure all the masa harina is moistened. When the oven is at 400 degrees, grab an oven mitt and pull the skillet out. Swirl the bacon grease around the pan, making sure it coats the bottom completely. Bonus points if you can get the sides, too! Quickly pour in the batter and smooth the top with a spatula. You will probably hear it sizzle as it hits the skillet. Stick it back in the oven and cook for 20 minutes, or until a toothpick or fork stuck in the middle comes out clean. Serve immediately (it's extra delicious with an extra dollop of butter on top) and once cool, store in an airtight container. Use within 3-4 days or freeze. I used the leftover cornbread in my last batch as a topping for homemade pot pie. It was really yummy! Don't be afraid to get creative. 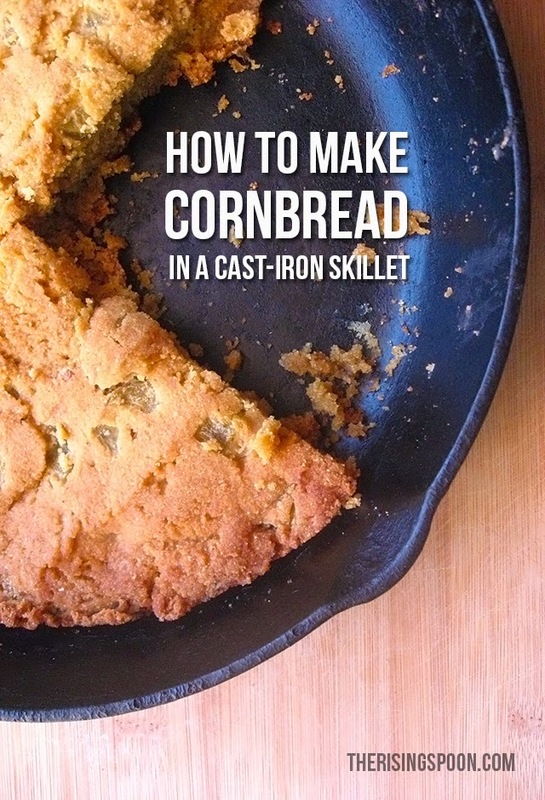 What's your favorite meal to serve with cornbread?